At a scant 1.8 pounds the Hyperlite Mountain Gear Dirigo 2 Tent is a serious contender for the title of “strongest, lightest and most storm-worthy backpacking tent” on the market. There is an exceptional and LIGHT tent here for every type of backpacker. But you’ll need to choose carefully to get the perfect tent for you at the right price! This guide to the Best Lightweight Backpacking Tents will help you do just that. Kammok with their Mantis UL Hammock Tent, brings modern Hammock Tent camping into mainstream camping, backpacking and thru-hiking culture as viable option to traditional tent camping. The new Big Agnes Fly Creek HV 2 Carbon with Dyneema tent pictured above weighs just 1 lb 2 oz for a two-person, freestanding, double-walled tent with a full pole set! 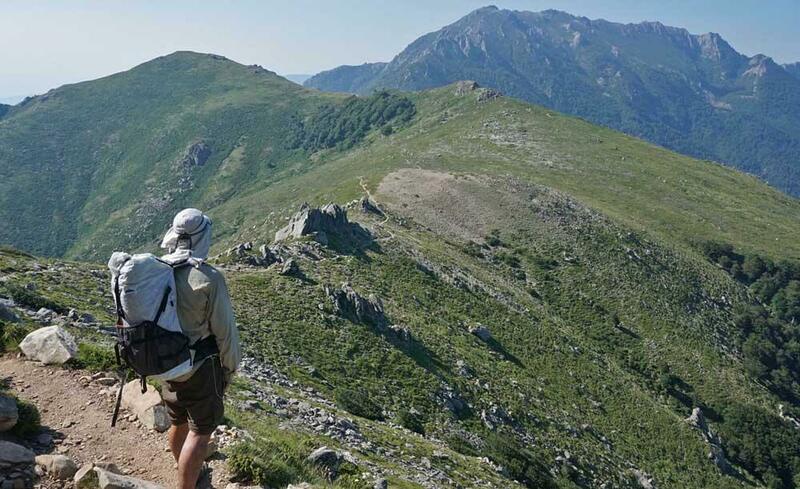 No trekking poles required. The incredibly popular, roomy and livable Tiger Walls series drops to 1.5 pounds with the new Big Agnes Tiger Wall 2 Carbon with Dyneema! And finally, the Big Agnes Scout 2 Carbon with Dyneema Tent is less than ¾ pounds. These are just a few of the new and very light tents that Big Agnes announced for Spring of ’19 at the Outdoor Retailer Summer Market trade show this month. 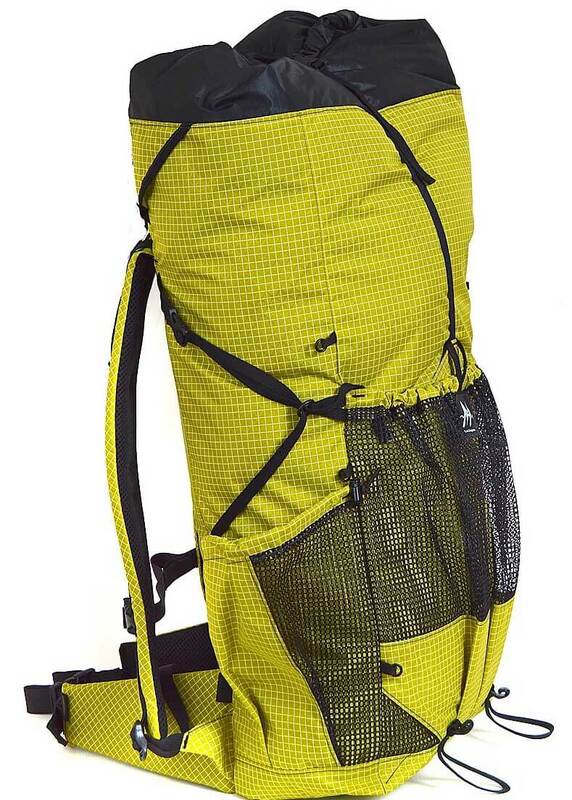 Classic UL uses 20d nylon fabric and aluminum poles. The least expensive and likely the most durable. Platinum uses much lighter and more delicate 7d fabric for the fly and floor and the same aluminum poles. This saves ~¼ pound for a 2-person tent and has a modest price increase. 30% weight reduction: For Spring ’19 the highly popular, roomy and livable Tiger Wall UL2 tent will come in a Carbon with Dyneema version reducing its weight by 1/2 pound vs. the “classic” model show in the photo. 1 lb 14 oz (850g): Tiger Wall 2 Carbon with Dyneema Tent. That’s a 30% reduction in weight vs. the “classic” Tiger Wall Tent. My guess is that this tent will be the big seller in this lineup for its more spacious interior and a door for each person. 1 lb 2 oz (501g): Fly Creek HV 2 Carbon with Dyneema (lead photo for this post). This is an astonishing weight for a 2-person, double-walled, free-standing tent that does not rely on trekking poles! (Note that this shelter is snugger than the Tiger Wall and has a single door). The obvious omission in the Carbon Collection lineup are the Big Agnes Copper Spur HV UL series tents, the former mainstay of Big Agnes’ Ultralight tents. This is almost certainly due to the immense popularity of the new Big Agnes Tiger Wall tents. Note: Durability these lighter tents, Platinum and Carbon with Dyneema Tents may hinge on a suitable footprint / groundsheet. Read more on this important topic below, including an extremely light $9 footprint hack. For 2019 the Fly Creek HV, Tiger Wall and Scout tents will be available in both Platinum and Carbon with Dyneema versions. 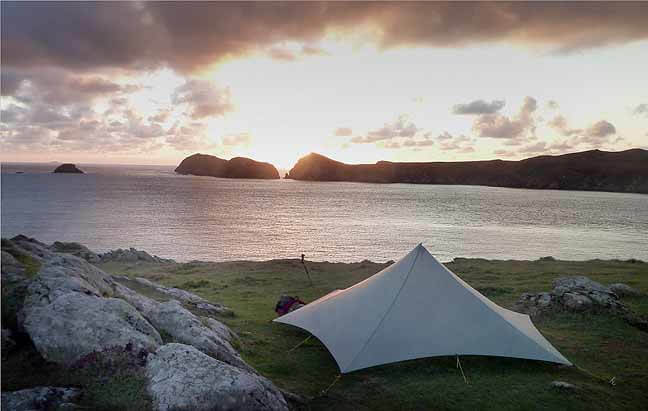 In addition, the Copper Spur tents will be available in Platinum but not in Carbon with Dyneema. Classic UL – These tents are already among the lightest conventional, double-walled free-standing tents on the markets. While the lowest cost of the three lines they are still among some of pricier tents on the market due to their light weight. The 20d fabric used for the rainfly and wall/floor of the tent is likely the lightest fabric that will survive use by casual users (e.g. those people not experienced in the use and care of ultralight camping gear.) This fabric will likely remain waterproof and undamaged for a number of seasons of use, especially if you use a Big Agnes Footprint or a $9 Gossamer Gear Polycro Footprint under it. Platinum – These tents use a much lighter 7d fabric used for the rainfly and wall/floor. This saves about 4 oz (¼ pound) and increases the price a few hundred dollars. And unless you are sleeping on nice soft grass, it almost requires you use a Big Agnes Footprint or a $9 Gossamer Gear Polycro Footprint under it. In addition, the lighter fabric requires that you use more care operating zippers, pitching and un-pitching the tent, etc to keep from damaging the fabric. Carbon with Dyneema – These tents use uber-tech Dyneema Composite Fabric (DCF) for the rainfly and wall/floor and carbon fiber (vs. aluminum) poles to save ~1/2 lb or 30% vs a UL Classic Tent. DCF incredibly strong and waterproof and light. In addition, it’s stiff and has very low stretch when wet making it ideal for use in shelters. That is, DCF does not sag when wet fabric and you don’t need to re-tension the the tent in the rain. Downsides for DCF is that it is insane expensive and has only OK abrasion and puncture resistance. In summary, the Carbon with Dyneema has clear advantages over the Classic UL version for its lighter weight and stiffer lower stretch fabric. It will be up to individuals to determine if those advantages are worth the significant increase in price. The advantages of the Platinum version vs. the Classic UL version are less clear. The Onyx Tarp Carbon with Dyneema is only 6 oz (170g) when used with trekking poles and covers 72 square feet. That’s super roomy for two people! Success of these tents may well rely on what BA puts under the floor to protect the more delicate DCF fabric tent floor. As of this writing BA has not revealed the weight and type of footprints that will be available for Carbon Collection tents. A too heavy footprint could negate much of the weight savings (right now a Big Agnes Tiger Wall UL2 Footprint weighs 6 oz and cost $70). On the other hand, not using a footprint could quickly damage your floor if you are not careful and/or experienced at campsite selection. The good news is you don’t need to wait for BA to solve this problem. To protect the floor of these very light tents, I would recommend putting a $9 Gossamer Gear Polycro Footprint under it. This multilayer, cross-linked polyolefin film weighs less than 4 oz and is much stronger and more durable than the typical painters plastic sheet you’d get at a hardware store. It’s also ~ 1/2 the weight and 12% the cost of a Big Agnes footprint. It should last for weeks of use. When it starts to wear it can easily be replaced by another $9 footprint. Finally, neither the Big Agnes Platinum Tents (only a few models out last year), and the Big Agnes Carbon with Dyneema Tents (not due until Spring ’19) have had sufficient field testing to determine their long term durability and waterproofness. It will be interesting to hear the feedback from consummate backpackers & thru-hikers that use these shelters for weeks or months on end vs. the casual weekend backpacker. DCF has been used for years by cottage manufactures for Tarps and Pyramid shelters, and even floors on Bivy Sacks. I own and love many of these shelters. They have been all over the world with me from Patagonia to Alaska. But none of these simple DCF shelters are tents with their complex of poles and multitude of panels and seams. By making complex tents with DCF, BA is entering uncharted territory. To give BA the benefit of the doubt, they have been one of the most successful manufactures of very light tents. As such, I wish them continued success with their new Carbon with Dyneema tents. I look forward to testing the Tiger Wall 2 Carbon with Dyneema as soon as it is available. Used without the inner-nest, the Sierra Designs High Route 1 FL Tent deserves a serious look as an innovative, 2-PERSON pyramid shelter. But if you frequently use the outer shelter and inner-nest together, you might consider other options. E.g. lighter 1-person shelters like the TarpTent Notch, or Mountain Laurel Designs Solomid XL; or roomier, freestanding 2-person “true-tents” like the REI Quarter Dome 2 or Big Agnes Copper Spur HV UL 2 Tent. Even so, the outer shell alone is a very nice pyramid shelter and Sierra Designs and Andrew Skurka deserve a lot of credit for thinking outside the box. 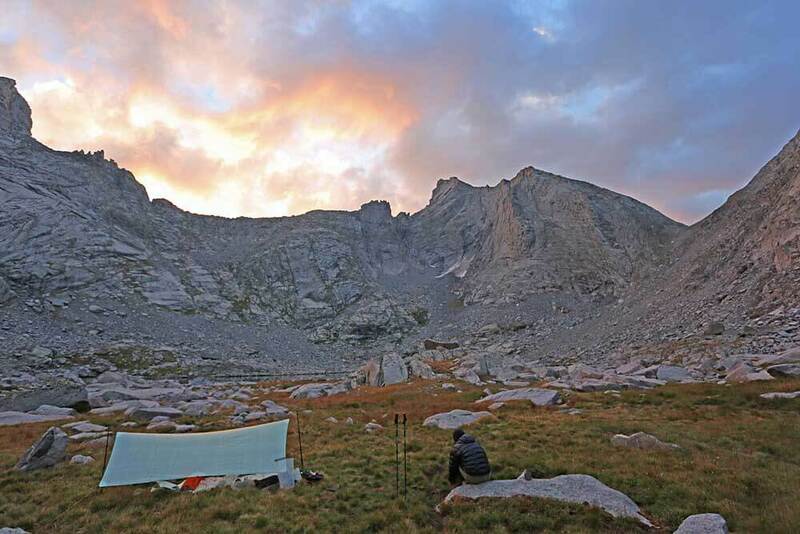 The High Route 1 FL is a one-person, two-part shelter. An outer shell (pyramid shelter) and an inner-nest (bug net and floor). When combined they are the equivalent of a double walled tent. Shelter has no poles. It uses two trekking poles for structure. 2 lb 10 oz for: Outer shell, inner-nest, 8 stakes, 2 stuff sacks and cordage. What is the Sierra Designs High Route 1 FL Tent? The Sierra Designs High Route 1 FL Tent is really “a pyramid shelter with an inner-nest option.” More specifically, it’s a 2-apex pyramid, meaning that two poles support the shelter at two “pyramid peaks.” A 2-apex pyramid (vs. single apex) provides more vertical walls and therefore more usable living area (in this case enough room for two people). If you want, you can attach the inner-nest, which gives you a floor and mosquito protection. The downside is that this reduces living area (down to 1-person), and significantly increases the time and complexity of setup. Product shot that shows the integration of outer shell and inner-nest. The back of the “tent” is a mirror image of the front. Used separately, I like the outer shell and even the inner-nest. A lot of thought went into their design. In particular, the outer shell is an innovative pyramid shelter with lots of room. It could easily sleep 2 in a pinch. The vertical walls greatly increase usable room. The High Route has one of the best implementations of using trekking poles to support a pyramid shelter. I really like that the poles are snug against the outside walls. This keeps them entirely out of the living area and door area. In addition it adds to the structural integrity of the vertical walls. The dual doors and, two peak vents provide good ventilation. The inner-nest (floor and bug netting) for the High Route can work as a stand-alone, stargazing shelter. The picture also better shows the dual apex design of the shelter. Note how the trekking poles are completely clear of the doors and living area. The combination is heavy for a 1-person non-freestanding tent that uses trekking poles for support. And there are lighter 1 person pyramid with inner-nest shelters like the 27 oz TarpTent Notch, or Mountain Laurel Designs Solomid XL with InnerNest. The High Route inner-nest halves your living area and increases overall weight. It also leaves scant “vestibule” area between the inner and outer tents. I found attaching the inner-nest a bit awkward, fiddly, and time consuming. There’s lots of clipping and then tension adjustments at every point, since no shock-cordage is used. All this is done crouched on your knees, many times reaching across the tent. Oblique view of the High Route showing the near vertical front wall, and the two apexes of the shelter. The rear wall (not visable) is a mirror image of the front wall you can see. Due to the vertical it’s a good idea to stake out the front guyline to the apex (lower left guline in photo) with a solid Y-stake if you expect strong winds. When used without the inner-nest, theSierra Designs High Route 1 FL Tent is worth a serious look. It is an innovative pyramid shelter that would likely work for two people. It even has dual doors! It’s made roomier by vertical walls and getting the trekking poles out of the living area. At about 12 oz per person (body less stakes is ~24 oz), it’s a reasonably light option for two people. It’s a shame that Sierra Designs doesn’t sell just the outer shell (pyramid shelter portion) separately like other manufactures, e.g. Hyperlite Mountain Gear, Mountain Laurel Designs and TarpTent. But if you can get the High Route on sale at around $240, you could just buy the whole thing and leave the inner-nest at home. But, if you think you’ll use the High Route outer shelter and inner-nest together most of the time, you might consider another shelter. Either lighter pyramid shelter with inner-nest combos from Hyperlite Mountain Gear, or the 27 oz TarpTent Notch and Mountain Laurel Designs Solomid XL with InnerNest. Or just getting a 2-person, freestanding, double-walled dome tent like the Big Agnes Copper Spur HV UL 2 Tent or the REI Quarter Dome 2 Tent, which is the same price, sleeps two and is only ½ pound heavier. Why would I not take a conventional tent? Pyramid Shelters, Tarps and Shaped Tarps are lighter and better ventilated than most Conventional Tents, yet give excellent wind and rain protection. For instance a pyramid shelter with a palatial 65+ ft2 floor area and 5+ feet of headroom can weigh between 1.5 to a only pound depending on fabric (43ft2/lb to 65 ft2/lb). A well-known 2-person backpacking tent is almost 5 pounds for 47 ft2 floor area and 3+ feet of headroom (9.6 ft2/lb). So the pyramid shelter has between 4.5 to 6.8 times more room per pound than a conventional backpacking tent—put differently it is a larger storm-worthy shelter that weighs 4 pounds less! See Shelter Weights and Stats for a detailed comparison table of Tents, Tarps and other Shelters. Pyramid shelters are light and keep you dry! Consider pyramids from Mountain Laurel Designs, Hyperlite Mountain Gear or My Trail Co. Pyramid shelters give you huge floor area and great storm protection for the minimum weight. Many of the pyramid shelters have an optional insert which has full mosquito netting and a bathtub floor, effectively making them a tent when needed. But giving you the option of leaving the insert at home, saving both weight and pack volume. The 7.8 ounce MLD Cuben Fiber Grace Duo Tarp was our choice for the Wind River High Route: Don and I weathered a strong thunder and hailstorm at the back of Cirque of the Towers. Exposed at over 10,000 feet in a mountain meadow, it kept us and all our down gear dry. These shelters are listed by weight (high to low). In general they are also listed in increasing floor area (ft2) per pound (lb) of shelter weight (ft2/lb) . That is a conventional 4 pound tent provides only 5 square feet of floor area per pound of shelter weight, while a Cuben Fiber tarp provides an astonishing 100 to 130 square feet per pound of shelter weight—over 20x floor area per pound. To save as much as 10 to 12 pounds with with the minimum of effort, look at The Big Three. 1) Backpack, 2) Tent/Shelter, and 3) Sleeping bag (or quilt). The lighter versions of these are just as functional as their heavier counterparts. They will carry your load and keep you warm and dry. The only thing you stand to lose is a bunch of weight off your back. And most people do not enjoy being a pack mule. It is rarely the highlight or happiest memory of a trip. Alternatively, unburdened from the misery of carrying a heavy pack, folks become joyful and alert—in the best state of mind to appreciate everything around them—the reason they went backpacking. The Big Three is the fastest way to achieve that goal. A pyramid shelter is likely your lightest effective shelter, unless the weather forecast is for constant, pouring-down rain or there are going to be a bunch of bugs (and there is an optional Innernet to handle that). This is the collective wisdom of literally decades of experience by most of the people I hike with. I know that many readers may still be unconvinced on this point. If so, you can jump to the Tent and Tarp Tents sections. Pyramid shelters give you the maximum coverage and storm protection for the minimum weight. Consider the palatial 65+ ft2 floor area and 5+ feet of headroom for the 1.5 pound Mountain Laurel Designs DuoMid XL (only 1 lb if you get it in Cuben Fiber). If you like to sleep out under the stars you can leave these shelters at the bottom of your pack, greatly reducing the time to setup and breakdown camp and without the weight penalty of carrying an unused conventional tent. (A two-person tarp weighs 8-12 oz and takes up virtually zero pack volume.) Many of pyramid shelters and shaped tarp shelters come with an optional “Innernest” which has full mosquito netting and a bathtub floor, effectively making them a tent when needed. But giving you the option of leaving the Innernest at home, saving the weight and volume. 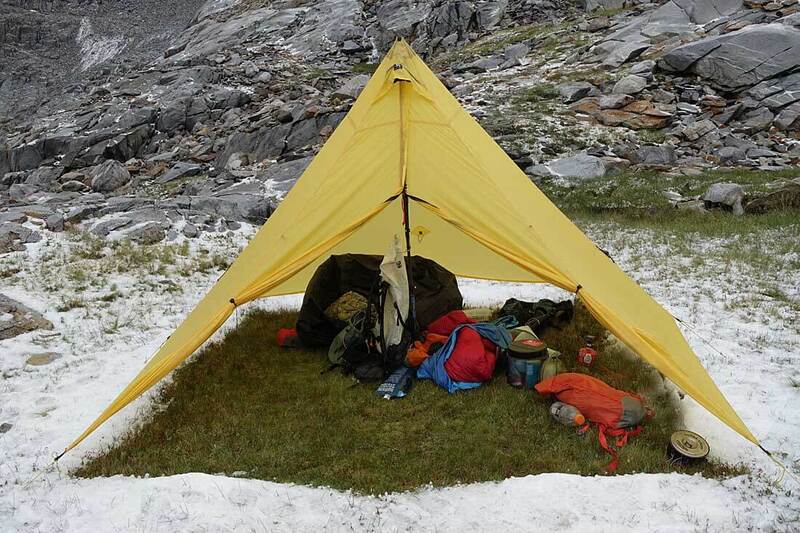 MLD SuperMid kept Don and I sheltered and dry from a freak and exceptionally violent Sierra storm at 11,000 feet. For a couple of hours we had 50mph winds, tons of rain and horizontal hail up to the size of quarters. Mountain Laurel Designs produces some of the finest Pyramid Shelters anywhere. Of note are the 11 ounce MLD SoloMid 2016, and for two people the DuoMid XL, or their largest shelter the SuperMid. I have used all these MLD Pyramid Shelters on trips to Alaska, Patagonia, the Sierras, major European treks and around the world—with good results even in challenging circumstances. These pyramids use your trekking poles for a center pole like a circus tent. Like many shelters in this section you have the option of Cuben Fiber, which while expensive (especially for larger pyramids) is light, incredibly strong, and waterproof. Cuben Fiber also doesn’t stretch, even when wet which means you don’t have to constantly re-tension guylines if it’s raining or just damp and dewey overnight. My Solomid 2016 is in Cuben, but my DuoMid XL is in the more cost effective Pro Silnylon. HMG Pyramids use Cuben Fiber and are exceptionally strong and light. 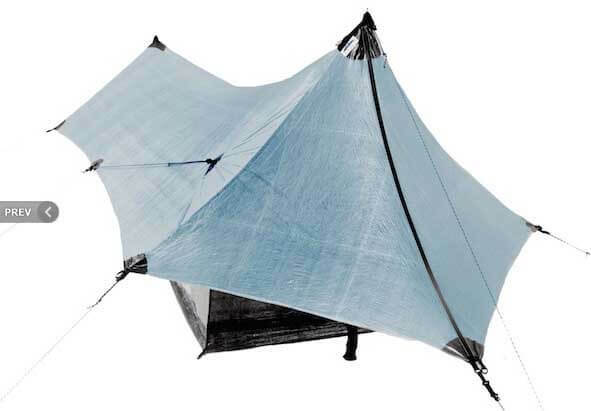 Hyperlite Mountain Gear produces excellent and light Cuben fiber Pyramid Shelters. They make two pyramid shelters, the 1 pound UltaMid 2-Person, and the 1.3 pound UltaMid 4-Person. Both have an optional bug mesh and floor insert. HMG shelters are only available in their CF8 Cuben Fiber. “Cuben Fiber is lightweight, highly durable, and is 50-70% lighter than Kevlar, four times stronger than Kevlar, and allows flex without losing strength. It also weighs less than Silnylon, it floats on water, is 100% waterproof and has high chemical and UV resistance.” While this provides exceptional performance and low weight, it is also expensive. There is is no lower cost Silnylon option for HMG shelters. The My Trail Co pyramid shelters are a good deal at since their price includes with everything you’d ever need: inner nest, pole, states and stuff sacks. My Trail Co Pyramid 4 and Pyramid 4 Shelters (by founder of GoLite) are other options for pyramid shelters. If you want both the pyramid and inner nest they are a great deal. Tarps and Shaped Tarps are significantly lighter and have more floor area than pyramid shelters. e.g. a 2-person MLD Grace Cuben Grace Duo tarp is 8 oz vs the 16 oz for the DuoMid XL. 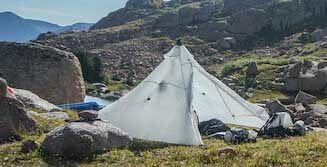 For many backpackers, Tarps and Shaped Tarps are more suited to places with occasional rain (Summer in the Sierras or the desert of Southern Utah) and/or for camping in more sheltered areas (below treeline, behind large rocks, etc.). Although some skilled and adventurous backpackers use them above treeline in the high mountains and other exposed areas that get appreciable wind and precipitation. Tarps work! 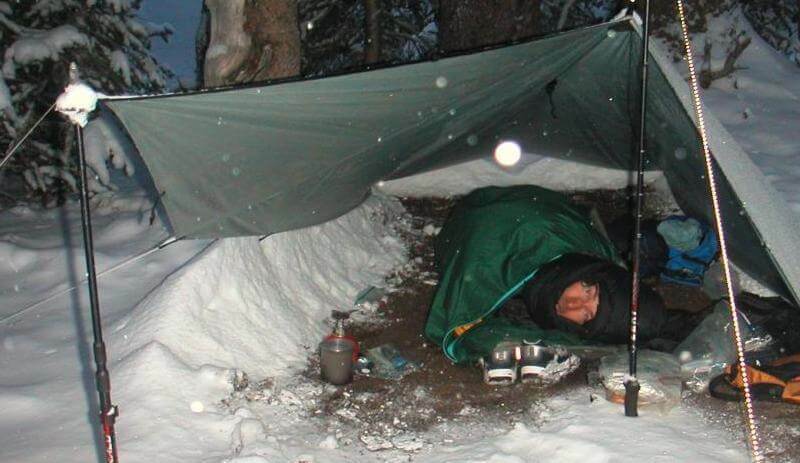 Blizzard in the Wind Rivers – a 15 degree night under a tarp & 1 lb down quilt. True Tarps have the advantage of being simpler, less expensive, lighter and having more pitching options from “close to the ground for storm protection,” to “airy lean-to pitches with great views.” Shaped Tarps tend to be a more storm resistant, but are are designed be pitched only one way—usually lower to the ground with less headroom and views. Note: I do not recommend a solo tarp—for just few ounces more you get almost double the coverage for a 2-person tarp. Mountain Laurel Designs True Tarps of note are the Grace Duo Tarps in either Silnylon or Cuben Fiber. The 7.8 ounce MLD Cuben Fiber Grace Duo Tarp is a personal favorite and where I think the upgrade to Cuben Fiber makes sense. Don and I shared one on our Wind River High Route. Mountain Laurel Designs Shaped Tarp of note is the award winning and perennial favorite TrailStar. Like the pyramid shelters it has an optional innernet. Hyperlite Mountain Gear True Tarps of note are the 8′ x 10′ Flat Tarp and the Echo II Tarp. Both have an optional bug mesh an floor insert. HMG tarps are only available in CF8 Cuben Fiber. 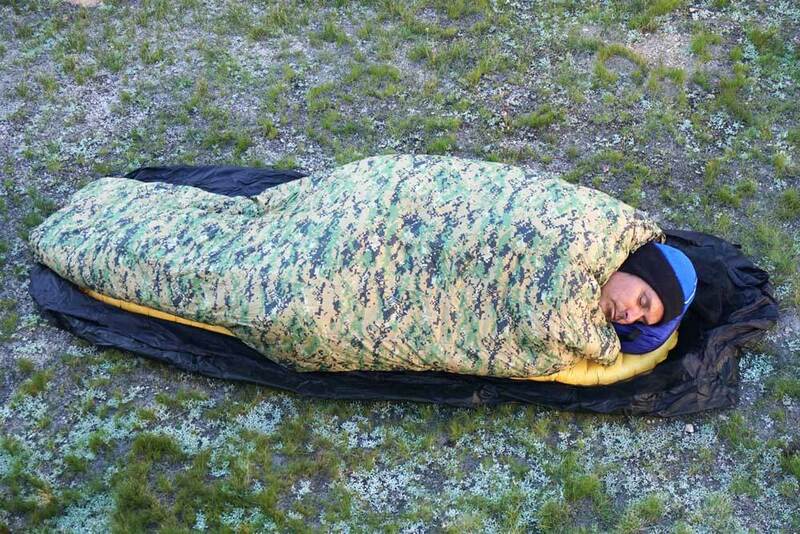 Hyperlite Mountain Gear Takes a modular approach for Shaped Tarps. The Echo Tarps have an optional Beak (a front end/vestibule add on for the tarp) and an an optional bug mesh an floor insert. Combined all three for a Echo Ultralight Shelter System (an extremely light “2-walled tent.”) But you have the option to take only the components needed for a particular trip. For Tarps available off-the-shelf from a major retailer, look at the Sea to Summit Escapist Tarp Shelter from REI or a MSR E-Wing 2 Person Shelter. But realistically tarps are not seriously carried by major retailers and you are better off getting a tarp from one of the manufacturers above (or other well regarded cottage manufacturers). For a Bargain Tarp: look at Etowah Gear’s Basic $75 8×10 Silnylon Tarp.